Tripp Lite Isolator series UL2601-1 listed Hospital Grade isolation transformers offer line isolation, continuous noise filtering and enhanced common mode surge suppression. Internal low-impedance isolation transformer component offers 100% isolation from the input AC line. Full UL2601-1 medical grade listing with hospital-grade plug and outlet receptacles makes Isolator Hospital Grade transformers ideal for the protection of sensitive electronic equipment in patient-care areas. Isolation transformer with Faraday shield reduces the cumulative leakage current of the Isolator and connected equipment to levels below 300 microamps. Secondary neutral to ground bonding virtually eliminates common mode noise, providing an isolated neutral-ground reference for sensitive equipment and an inexpensive alternative to the installation of dedicated circuits and site electrical upgrades. Removes EMI/RFI noise, utility switching transients, and harmonics generated by other on-site loads and utility or lightning related surge conditions. Additional surge suppression components placed at the line input and output combined with full line isolation offers continuous filtering of a full range of power line noise in all modes. Active transformer filtering offers continuous common-mode noise rejection with no wearable parts, uniquely able to reduce surges in the worst of power environments to harmless levels. Reduces 6000V IEEE587 Cat A&B ring wave and combination wave test surges to only 0.5V common mode. Model IS1000HG includes 4 widely spaced NEMA5-15R hospital grade output receptacles, a 6 ft power cord, hospital grade input plug, circuit breaker overload protection and lighted power switch. Rugged all-metal unit housing ships ready for placement in any industrial, medical, office or network environment. All isolation transformers must conform to the UL 60601-1 standard when used within patient care areas. Prevent power disruptions for all sensitive devices in patient care areas and other vulnerable environments with Tripp Lite’s IS1000HG Medical-Grade Isolation Transformer and Power Conditioner. Featuring an internal isolation transformer in an all-metal housing with Faraday Shielding, the IS1000HG completely isolates equipment from line noise that can cause incremental, but devastating, equipment damage. Its 680-joule surge suppression rating protects equipment from surges and spikes caused by utility power disruptions and nearby equipment operating on the same circuit. With 100% isolation from the input AC line, the IS1000HG eliminates leakage and shock potential down to less than 100 microamps. The IS1000HG’s 10-foot power cord allows for flexibility when installing, while the built-in circuit breaker prevents dangerous circuit overloads. A 1000-watt capacity allows the IS1000HG to be used with a variety of sensitive monitoring, diagnostic and computer equipment. The widely spaced hospital-grade output receptacles fit any standard input plug, and the power switch offers convenient, one-touch control. For peace of mind, the IS1000HG comes with a two-year warranty, is TAA-compliant for GSA Schedule purchases, and uses a RoHS-compliant design. UL 60601-1 compliance is required for isolation transformers within patient care areas in order to avoid hazardous conditions and provide an optimally safe environment for patients, staff and visitors. By isolating equipment from unpredictable and disruptive utility power, the IS1000HG eliminates the need for dedicated circuits or costly upgrades to a healthcare facility’s electrical system. The internal isolation transformer with Faraday Shielding provides 100% isolation from the AC power line for equipment plugged into the IS1000HG and reduces leakage to less than 100 microamps for full UL 60601-1 compliance. The IS1000HG is perfect for protecting sensitive medical equipment that can be affected by EMI/RFI line noise, utility switching transients, background spikes and other unpredictable power conditions. 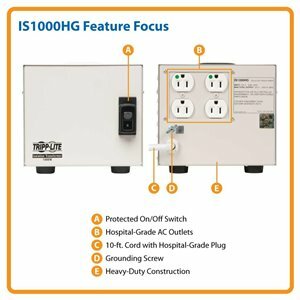 The IS1000HG’s 1000-watt capacity can handle a variety of electronic medical devices, while features like a 680-joule surge suppression rating, integrated circuit breaker and powerful line noise filtering ensure ultimate protection and safety in even the most hazardous conditions. With continuous transformer filtering and no wearable parts, the IS1000HG reduces surges in the worst power environments to harmless levels. A 10-foot cord allows for flexible installation, while four hospital-grade NEMA 5-15R-HG output receptacles let you plug standard equipment into the IS1000HG without any adapters or custom power cords. Operation is easy; simply plug the IS1000HG into a grounded three-prong utility outlet, plug your equipment into the IS1000HG and turn the power on with simple, one-touch power switch. The IS1000HG is backed by a two-year warranty and is compliant with UL 60601-1, TAA, and RoHS standards.